Don't let the size fool you, this tiny Bahamian island has plenty to offer in the way of nightlife, fine restaurants, shopping, unique places to stay, and one of the best-rated beaches in the world. Pink Sand Beach is a light rose color in the daylight, and once the sun sets the color is strikingly pink! Dunmore Town is the only town on Harbour Island, one of the Bahamas’ oldest settlements and was once the capital city in the late 18th century. Golf carts are the transportation of choice, and if you are a cyclist a bike rental will give you a good workout as the island is rather hilly. After you get out and about, park the cart or bike. Take a leisurely walk around and view the colorful New England colonial architecture on almost every street. 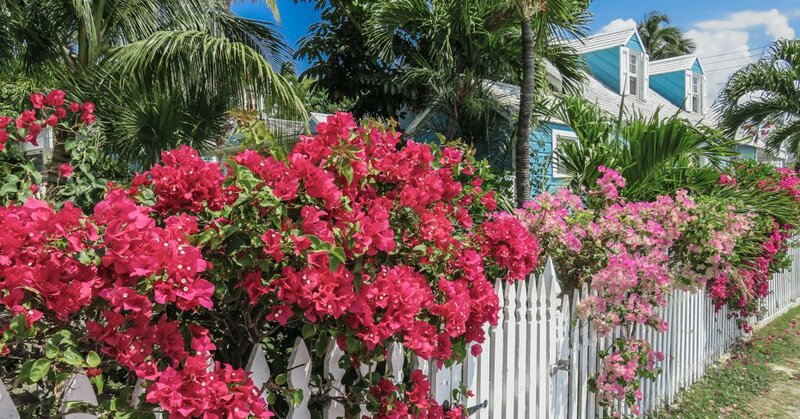 The streets are lined with white picket fences and tropical flowers. 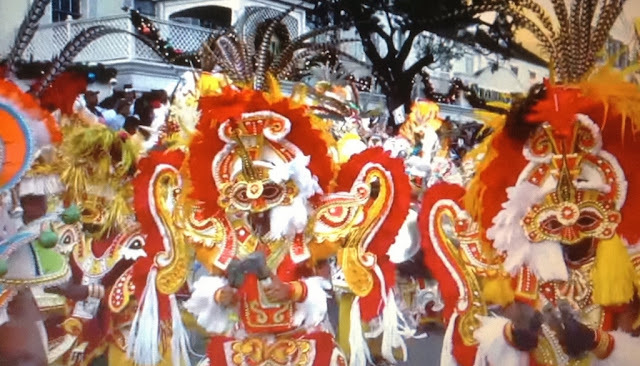 Dunmore is quite captivating with funky little shops, high-end boutiques, art galleries, street merchants, and many places to eat and sip a cocktail. The town was Founded by Tories fleeing America during the Revolutionary War and was named after Lord Dunmore, who was the governor of the Bahamas from 1786 to 1797. You can find great accommodations on the harbor or beach side. The island is only 1/2 miles wide, and it takes less than 10 minutes to go from one side to the other. I can personally recommend the following properties having stayed at Valentines Resort and Pink Sands, and visited the others listed below. Just 25 one-story pastel color luxury cottages located on 20 acres of lush tropical landscaping. 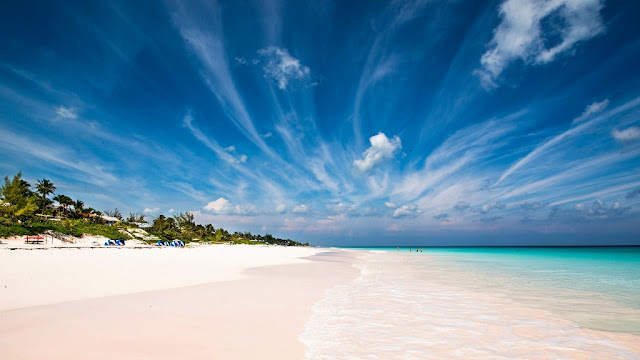 The property is set right on famous Pink Sand Beach, and here guests can experience old world charm and Bahamian luxury. The on-site restaurant is well known for its fine cuisine, and most of the fruit, vegetables, and herbs are grown on the property. The Resort & Marina is located on the harbor side of Harbour Island and is an easy stroll to famous Pink Sands Beach, and close to the best shopping and restaurants of Dunmore Town. All accommodations have stylish island decor, along with a spacious patio or terrace. Boathouse Waterfront Restaurant features classic Bahamian dishes, and the Rooster Tail Bar & Grill serves elegant seafood. In the evening the bar draws a jet-set crowd of island hoppers. This historic property dates back to 1800's and is right in the heart of Dunmore Town, and an easy five-minute stroll to the powder pink sand beach. Beach chairs and umbrellas are available for guests. Rooms have mahogany four-poster beds with luxury linens, air conditioning, and some offer verandahs, and most rooms have a view of the harbor. The on-site restaurant is one of the best on the island and is a favorite spot among for all travelers staying on Harbour Island. Rock House has been part of the Harbour Island landscape since the early 1940’s. The hotel was originally a private home, then a Bed and Breakfast and for many years a rental property. Today it has been updated to an intimate boutique with 12 adults only rooms. Amenities include fine dining, private beach service, pool and cabanas, and onsite gym. An understated elegant beach escape where the vibe is 1960's vintage glam. The coastal chic cottages and private residences are decorated in varying shades of blue. The Clubhouse Restaurant is popular with visitors around the island, and offers casual fine dining with delicious local seafood, along with a blend of French and Continental cuisine. This is a secluded, little sanctuary with 38 rooms, and the vibe is low key and casually elegant. On-site restaurant and beach bar offering specialties with a touch of French and Asian Fusion flavors. Complimentary water and beachside equipment such as kayaks, paddle boards, beach bicycles, snorkeling equipment, beach volleyball, and lighted tennis court. Shopping ranges from traditional street-side straw vendors to the work of local painters, fashion and jewelry designers. With items ranging from high-end home décor to a variety of local music stores, there is something for everyone. Water sports include bonefishing in the pristine water off Harbour Island’s coast. The island is surrounded by exquisite coral reefs, grotto's, underwater blow holes, wall and wreck dives, and high speed drift dives - overall some of the best diving in the world. Popular dive sites include the massive Plateau and the Arch coral structures, along with diving at Briland’s Blue Hole. For an extra vacation treat take the water taxi to Eleuthera and spend a day visiting the amazing beaches along with the infamous Glass Window Bridge where the raging Atlantic Ocean and Caribbean Sea meet. Stop by Tippy's for a great beach lunch and drinks. Get directions from the locals, however it's hard to get lost as there is only one main road. Travelers can fly into North Eleuthera Airport from Miami, Fort Lauderdale or Nassau or take the Bahamas Fast Ferry from Nassau to Eleuthera. The ferry ride from Nassau to Eleuthera is approximately 2 1/2 hours. Once on Eleuthera, it's a 10-minute cab ride from the airport to the boat dock and just a 10-minute water taxi ride to Harbour Island by water taxi.